So there it is. 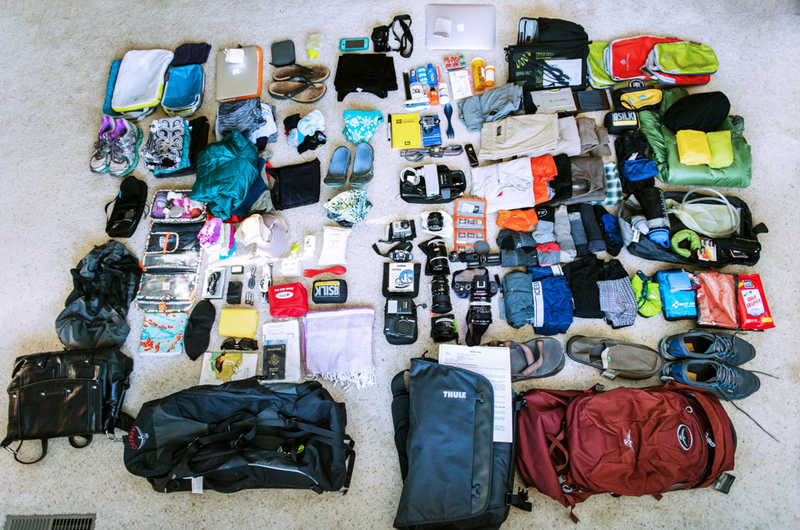 Everything that we will be bringing with us on our Round-the-World adventure, starting tonight. We’ve been working on our bags for a little over a month now, making small adjustments here and there, tossing stuff out that we FINALLY deemed unnecessary, remembering that last little thing that we could not live without. Moving out of our house in Carbondale and into my parent’s house for a couple weeks helped us downsize, given that we have only my childhood bedroom as a storage unit. Reading travel blog suggestions of “pack everything and then cut half of it out” sounded outlandish and extreme a month ago, but of course by today seem totally reasonable, even generous. Jenna is still making fun of me for my ridiculous amounts of camera gear, and I am sure we’ll be downsizing a lot more as we get used to living out of backpacks, but for now we feel confident that we have what we need and not too much more. The question we get most often, after “where are you going to go?” is “how on earth do you pack for a full year?” Below is a full list of everything that we are bringing with us. Once we’ve been traveling for a while, we’ll do an updated list to see what was really necessary and, I’m sure, laugh at our naïve assumptions. First Aid kit with prescriptions for Cipro, Vicodin, Malarone, etc. 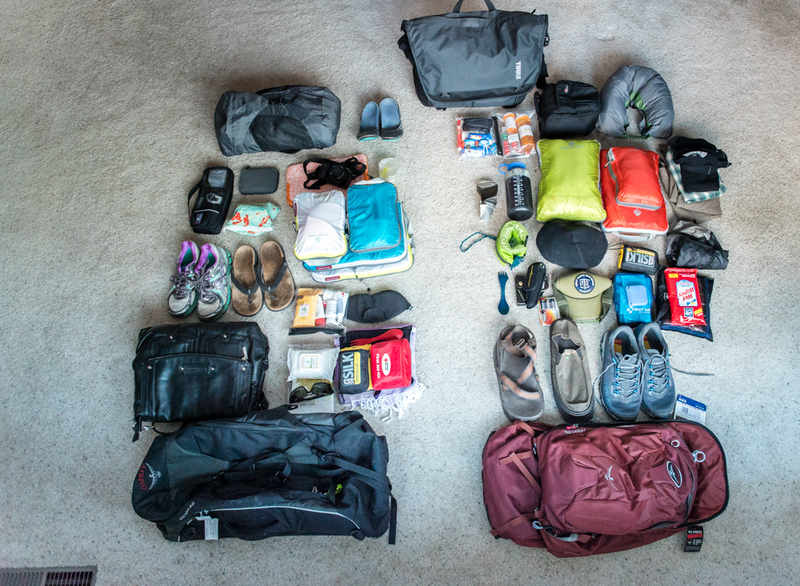 Once we laid everything out and double checked it, we moved as much as we could into packing cubes and cases, which will help keep everything organized. Then, it was just a matter of putting each cube into our packs! 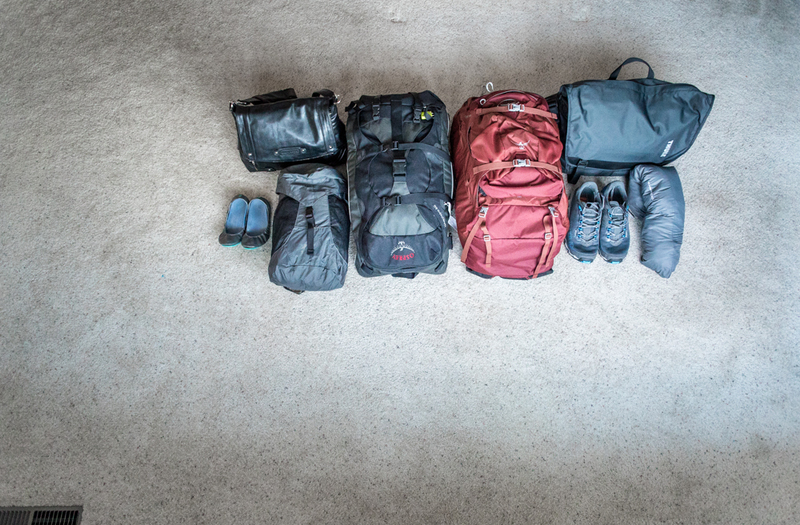 There they are–our lives packed up into two bags each (sometimes three if we use our extra packs). I get bursts of panic thinking I forgot something, before remembering I packed it (and repacked it and repacked it). Check back for updates to see what we loved, what we left behind, and what we can’t live without as we travel on! FYI: Nobody is compensating us for mentioning their products and all opinions are our own; Bellroy generously provided us with wallets, but other than that we paid for everything you see above!